Serbia, Montenegro, Yugoslavia... Where is it? 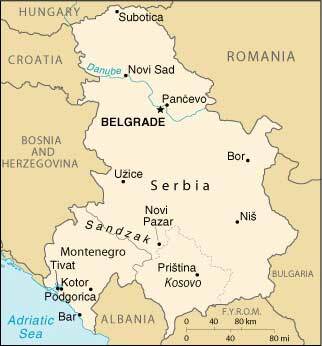 Until 1991 Yugoslavia existed as a country in South-Eastern Europe. It was formed of six republics. In 1991. the country broke up, and several new, independent states were formed. After the disintegration of Yugoslavia, the republics of Serbia and Montenegro decided that they are the succesors of the former state. They formed a federation, and kept the name of Yugoslavia. In the spring of 2003, the name "Yugoslavia" became history. The name of our country was changed simply to "Serbia and Montenegro". Finally, in May 2006, Montenegro left the fedaration, and both Serbia and Montenegro became independent countries. Therefore, if on this pages you stumble accross the references of "Yugoslavia", it is most probable that they refer to the 1991-2003 Yugoslavia, and it equals to the country formerly named "Serbia and Montenegro". Materijal sa ovog sajta ne sme da se plagira, ali sme da se koristi u nekomercijalne svrhe, u razumnim okvirima, uz obavezno navođenje izvora odakle je preuzet. You are free to use the material from this site for noncommercial purposes only, as long as the original source (this site) is credited.